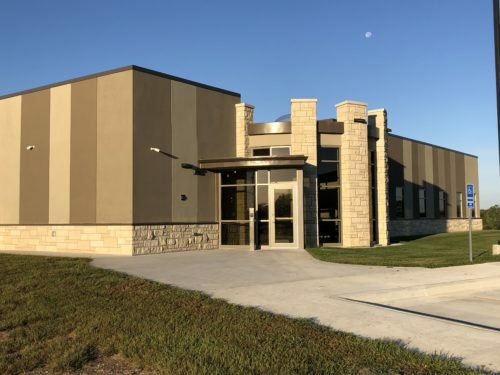 This wonderful facility has been completed and turned over to the Prairie Band Potawatomi Nation and will serve their community as the Behavioral Health Clinic. The exterior features of the building represent natural colors of the earth or ground and were designed to blend with the natural surroundings. Native stones, earth tone E.F.I.S, warm colored metals, and tinted glass surround this dynamic looking facility. The warm finishes carry on to the interior spaces as well from flooring to paint finishes, a perfect mix of colors and products. Dan Connelly, Mar Lan’s superintendent, enjoyed working with such a mix of different media that make up all the elements of this building.